In undertaking the design of a power supply unit, once overall specifications have been determined, the next step would be to choose between a switching or linear regulator. Setting aside situations where the choice is clear from the standpoint of meeting required specifications, there are many cases in which either one could do the job. If this is the case, an evaluation must be conducted by considering the pros and cons of each option. Figure 29 describes the advantages and disadvantages of the switching regulator; Figure 30 summarizes comparisons with the linear regulator. The greatest advantage of the switching regulator lies in its flexibility in performing conversions. Although buck conversion may be the most frequently employed type of conversion, the switching regulator can be used to perform stepping-up from a low-voltage source, such as a battery; produce a negative voltage by inverting the positive voltage; or perform buck/boost conversion when the input voltage from a lithium ion rechargeable battery (e.g. 4.2V to 2.8V) crosses over the output voltage such as a 3.3V. Another performance factor in favor of the switching regulator may be high efficiency, as would be expected. Depending on the type, switching regulators can achieve a maximum of 95% efficiency, although subject to the magnitude of the load current. 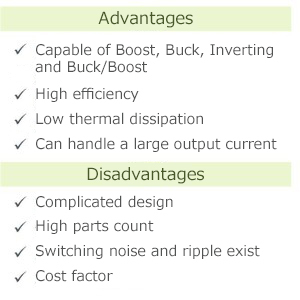 Basically, as the load current diminishes, the efficiency declines significantly. This fact, related to the increasingly stringent need to reduce standby power, represents the significant issue to be addressed in the design of switching regulators. The disadvantage is that the switching regulator requires passive components like capacitors and resistors; semiconductors, such as diodes and transistors; and magnetic parts; with an attendant increase in the number of required parts and complexity in design. Newer switching power supply ICs feature higher level of integration and innovations for making the adjustment process simpler, for greater ease of power supply design. Nevertheless, there is no denying that compared with the linear regulator, the switching regulator is more complicated. In addition, switching operations involve noise and ripples, to be avoided in noise-averse applications. Also, compliance with electromagnetic interference (EMI) regulations requires labor-intensive, time-consuming evaluation processes. As a final point, in terms of the costs of IC and other components, the switching regulator is necessarily pricier than the linear regulator. That said, the linear regulator including a heat sink must contend with increased footprint and volume, with the result that as the magnitude of power to be converted increases, the switching regulator in some cases may offer a lower total solution cost. 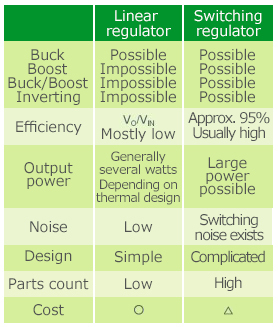 In designing a power supply, it is imperative to select a method that is best suited for a given objective by critically evaluating the relevant advantages and disadvantages. ・Whereas the greatest advantage of the switching regulator lies in high efficiency, in order to avoid various issues, the designer needs to have a good understanding of its disadvantages as well.